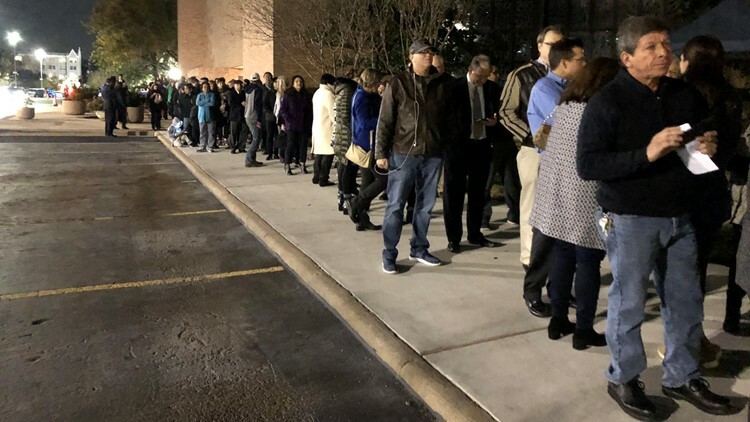 HOUSTON - More than 11,000 of people lined up at Second Baptist Church on Woodway Wednesday, waiting for their chance to bid adieu to President George H. W. Bush in person. The mourners ranged in ages and backgrounds, each with their own reason for going. Thousands of people lined up at Second Baptist Church on Woodway Wednesday because they want to honor President George H.W. Bush. Naval Petty Officer 3rd Class Amaury Mercado served in the Navy during Bush’s presidency and deployed during Desert Storm. Eve Beasley is a Houstonian and waited in line with her 7-year-old granddaughter, Jamie. Jan Robertson is a teacher at George Bush High School and said she tried to pass on Bush’s legacy of kindness to her students daily. People who visited St. Martin’s Episcopal Church said they were only able to have a few moments in front of 41’s casket before moving on, but the mood inside the church is one they will never forget. From start to finish, it took about 90 minutes for a person to move through the line at Second Baptist Church then load onto a bus headed for St. Martin's, but people say that it was worth every minute to say goodbye to Houston’s President. “His soul and spirit will be around this city and have a lasting impact forever,” said Houstonian Brian Duffy.